A patient's transfer of care (discharge) from hospital can be delayed for many reasons. We know from patient surveys and published research that patients can wait unnecessarily for discharge once they are medically cleared to leave the hospital. Criteria Led Discharge ( CLD ) is a process to ensure patients can return home from hospital as safely and quickly as possible. Under CLD the decision for discharge is made and documented by the senior medical clinician (e.g. Senior Consultant, Medical Fellow, Visiting Medical Officer). Additional criteria may be added by the interdisciplinary team members. For appropriate patients CLD competent staff (e.g. nursing, allied health, junior medical officer) can then facilitate the discharge of a patient according to documented criteria. The CLD competent staff member is responsible for monitoring that the CLD criteria have been met. To identify a patient as eligible for CLD on admission (or pre-admission for planned admissions). To continue to review patients every day by the medical team and update the set criteria, if required. To agree the criteria and subsequent plan for discharge in partnership with the entire health care team, including the patient and/or their carer. For the CLD competent staff member to monitor and record if the patient has met the criteria. This does not substitute for clinical judgement and if a patient does not meet the criteria a medical review is necessary. For a transfer of care (discharge) checklist to be completed for all patients, this should include a section on patient education that has been provided. Download the appendices from the toolkit separately (zip 4.6MB) or as individual files. For further information please contact Sue Schasser. 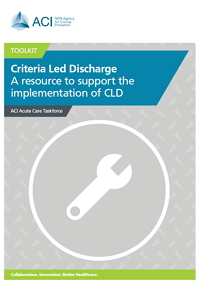 The ACI Acute Care Taskforce has developed a set of resources to support the implementation of CLD . an alternative 3 fold patient information leaflet being tested by Dubbo Hospital. If you don’t have access to MS Publisher you can download a pdf version of the patient information leaflet. Work has begun on including the CLD model within Inpatient Mental Health wards. Since early 2014 teams have been developing a local approach to improving patient care through more standardised discharge practices. Some of the local innovations are listed below. If you would like your CLD form added to these innovations please email Sue Schasser, Manager, Acute Care on sue.schasser@health.nsw.gov.au. Dubbo Hospital has also developed a revised CLD patient leaflet (testing draft). Royal Prince Alfred Hospital has adapted the CLD process to develop criteria for transfer to Balmain Hospital from RPA Geriatric Medicine. This form clearly outlines the process for transfer and the criteria for transfer. A PDF version of the form can be downloaded: Criteria Led Transfers between RPA and Balmain Hospital.